Mixing needles are included in the packaging by the manufacturer. Administrating / injecting needles need to bought from a local pharmacy. 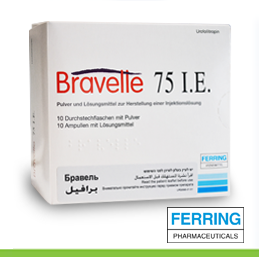 We sell Bravelle in boxes of 10 vials (we do not sell half / part boxes). It is usually cheaper to buy an additional box from us than to buy individual vials from a US pharmacy. I was quoted over $2600 for just bravelle and got it from ivfpharmacy for $1280. Great service and amazing prices. My order arrived in four days!! much faster than expected. Really helpful customer service and saved a ton. After no results with follistim my doctor moved me to bravelle and that seemed to do the trick. I used bravelle for stims�and responded really well. 19 eggs retrieved! Was nervous ordering from Israel - wasted worry. Same bravelle as sold here but less $$$ and more languages on the drug information leaflet - but the box and instructions are in English.